Many years ago I had an orange, Volkswagon bug. It was parked on the side of the street in a parallel parking spot. 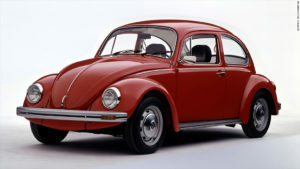 A disoriented driver came along the street in a vehicle and accidentally rammed the bug in the rear. Amazingly the back glass popped out intact and landed on the narrow grassy strip between the concrete curb of the street and the concrete sidewalk. It rested parallel to the street and sidewalk, unbroken. The impact damaged the engine causing it to leak oil. I was happy that I was able to re-install the unbroken glass, and by keeping several quarts of oil with me in the car, I was able to drive it until I was could get it worked on. Then after getting the oil leak fixed, I drove the rammed bug until I sold it. Sometimes things happen that are amazing. It makes us stop and wonder about the fact that it happened as it did. We all have stories of such wonderment of things that have happened in everyday life. It is no different in the Bible. Jesus was anointed with, was endued with, the supernatural power of the Holy Spirit. The Bible says he went about doing good and healing all who were oppressed of the devil, for God was with him (Acts 10:38). Blind eyes were opened, inoperative limbs were made whole, and the dead were raised. There were many things done through his life that made people stop and wonder about what happened. After the people were filled with the Spirit in the book of Acts, the same types of things happened through their lives. People talked about and wondered about what was happening. Today, many of us say God is with us. It is one thing to say it, and it is another thing to truly believe it. God was with Jesus and signs and wonders occurred through his life. God was with the early church and signs and wonders occurred through their lives. Today, if we really give ourselves to believe that God is with us, the Bible says signs and wonders will follow. “And these signs shall follow them that believe; In my name shall they cast out devils; they shall speak with new tongues; they shall take up serpents; and if they drink any deadly thing, it shall not hurt them; they shall lay hands on the sick, and they shall recover” (Mark 16:17,18). Our lives will show what we believe. What we show causes people to think about it, wonder about it and talk about it. That’s OK. Whether it is a banged up bug with unbroken glass, or blind eyes that have been blessed to be opened, amazing things happen in life!